Discovery Harbour is a picturesque 19th-century site that re-creates the days of the British navy and military on beautiful Penetanguishene Bay. Visitors can tour the heritage properties and explore the life of sailors, shipwrights, soldiers, and officers at this historic outpost built to defend Upper Canada. 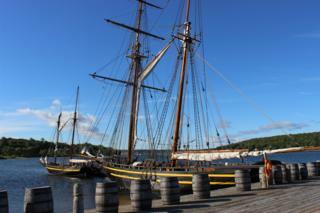 Discovery Harbour is also home of the King's Wharf Theatre and historic ships H.M.S. Tecumseth and Bee. The roots of Discovery Harbour date back to 1793, when Sir John Graves Simcoe scouted Penetanguishene Bay as a strategic site for a naval base. The steep-sided, deep water bay would be an ideal spot to protect and maintain ships. The bay could also serve as a vital transport link from York (Toronto) to the northwest. The War of 1812 between Britain and the United States sparked the construction of an active naval dockyard at Penetanguishene. By 1817, the British Navy, anxious to patrol and protect the Upper Great Lakes against a future attack, began building the Naval Establishment. The Naval Establishment would soon become a permanent home to the warships H.M.S Tecumseth and H.M.S. Newash. The ships were later "put in ordinary", their rigging and armaments removed and stored and their hulls maintained. Other vessels (including the supply ships Bee, Mosquito and Wasp) transported cargo and supplies. By 1820, the base was maintaining over 20 vessels. It supplied British posts to the northwest, and housed over 70 people, including officers and their families, sailors, civilian workers and soldiers. The Naval Establishment was the winter home of Lieutenant Henry Wolsey Bayfield, early in his surveying career. Famed explorer Sir John Franklin made a stopover here enroute to his second polar expedition in 1825. As relations with the Americans improved, the British gradually withdrew their naval forces from Canada. In 1828, a British military force moved from Drummond Island (now part of Michigan) when it was ceded to the Americans. Many soldiers and settlers joined the small military contingent at Penetanguishene. By 1834, the Navy had shipped out, and the base was now fully military. Soldiers maintained daily drill and garrison routines, and were ready for war. Impressive officers' quarters and barracks were built. The community continued to grow. British officers, their families, and French traders settled into active life with the first permanent residents. They were joined by British Army pensioners who settled in the area. You can find many of their family names in today's Penetanguishene telephone directory. H.M.S Tecumseth: one of two warships that were kept at the Naval Establishment in 1817. Originally built in Chippewa in 1814, H.M.S. Tecumseth transported troops and supplies in the aftermath of the War of 1812. Along with her sister ship H.M.S. Newash, H.M.S. Tecumseth was eventually stripped of rigging and armaments, and put in her final mooring in anticipation of further action. No such request ever came. The ships eventually broke up, and sank to the bottom of Penetanguishene Bay. H.M.S Bee: The Bee was one of three major transport vessels at the Naval Establishment. Schooner rigged, she was designed to travel the waters of the Great Lakes. The Bee and served as an important link in carrying essential equipment and supplies. Her sister ships were the Mosquito and the Wasp. The British Navy employed civilians in the Dockyard to maintain vessels and buildings. There was a variety of tradesmen working here, including sawyers, shipwrights, and blacksmiths, all working under the direction of the quarterman. A lack of money, manpower, and materials made ship and building repair at Penetanguishene difficult. Budget restrictions were common. The sawpit operation was slow, and requests for a steam-powered sawmill and copper boilers for the steam kiln were denied. The need for short-term repairs to many of the vessels made it necessary to use green, unseasoned wood. By the fall of 1820, two of the three transport schooners needed major work, and H.M.S. Tecumseth and Newash were deteriorating. The demands of a fleet of aging boats soon outgrew the capabilities of the shrinking dockyard operation. Sailor's Barracks: "R" means "run"
The sailors stationed at Penetanguishene came from varied backgrounds. Some had seen action in the Napoleonic Wars and the War of 1812. Many of them likely dreaded a posting at such a remote base. But at a time when thousands of naval men were searching for work, Penetanguishene at least offered a job. Isolation pay was a bonus. It"s likely that many shipboard routines, such as sleeping in hammocks and regular watch duty, were transferred to on-shore life at Penetanguishene. After long days of tending gardens, repairing ships and rigging, and eating burgoo (stew made with whatever was available) and hardtack (flatbread used on long voyages), the men sometimes deserted. Muster lists from the time were dotted with "R's" - a letter indicating a sailor had "Run". Drunkenness was a popular escape, made possible by saving up daily grog (rum) rations. In 1819, the Royal Navy selected Captain Samuel Roberts to command the base at Penetanguishene. Roberts was an experienced naval officer with a distinguished career, and this opportunity provided some financial security after the war. Roberts coordinated all personnel and activities at the Penetanguishene base for two years. His duties included providing written orders, inspecting operations and financing, approving estimates for supplies, monitoring conduct, and acting as a magistrate. Roberts" life at Penetanguishene was made a little easier when he got permission to bring along his wife Rosamond and her sister Letitia. The Roberts women noted that the house was in poor condition, writing in 1820 that "the wind has a thorough passage through every part of it, and in wet weather the water rises above the flooring". Repairs were made, but Captain Roberts' request for an office separate from his living quarters was never granted. This greatly inconvenienced normal family life. Social life at the Naval Establishment was sometimes lonely. The Roberts women would have passed much of their time pursuing hobbies like needlework, and reading and writing. Within their limited social circle, dinner and tea-and-card parties would also have been popular. Since public drunkenness was common, the Roberts family rarely took daytime walks. Lieutenant Bayfield even noted that although they were beautiful and accomplished, he feared the Roberts women were going to "bloom unseen and unadmired in the woods..."
The Assistant Surgeon, Clement Todd, took care of all medical needs. Todd joined the British Navy in 1812 and was posted to Penetanguishene by 1819. In 1821, he married Eliza Caldwell from Markham, and the couple remained at the Naval Establishment until 1827. In addition to working in his house, Todd spent a lot of time in the small hospital beyond the original Naval Storehouse. Supplies were provided by the Kingston Dockyard, and included sheets and blankets, tea, sugar, rum, wines, lemon juice, soap and towels, scales, warming pans, and candles. As the lone medical person at this remote outpost, Todd's duties were extensive. As Captain Roberts wrote, "...the responsibility attached to the duty of an assistant surgeon at an outpost in Canada far exceeds any he would be liable to serving on board a ship..."
Medical practices in the early part of the 19th century were an interesting mix of observation, science and even superstition. Scientific inquiry was flourishing among the medical professionals of Western Europe and Great Britain at this time. Yet at the same time, using leeches (for bloodletting) was also very popular. Leeches were scarce from 1800-1825, particularly in the British Isles. Todd would have had current medical information, and likely used similar practices. However, he also showed an avid interest in botany as a source of medical treatments. He sent a collection of plant specimens, personal records of seasonal phenomena and the medical use of plants to England for further study. In 1828, he published an academic paper. Todd is considered the earliest to record these types of observations in Upper Canada. The graves here (with original tombstones) are from the military period of the Establishments. The hardships of travel at this time are clearly demonstrated in the story of one of the graves. Soldiers sent to Upper Canada first went to headquarters at Kingston or York, and detachments were sent on to small outposts such as Penetanguishene. The earlier regiments came in on the muddy ruts of the Penetanguishene Road, which ran from Penetanguishene to the head of Kempenfelt Bay on Lake Simcoe. It was on this route in June 1831, that two brothers, Privates John and Samuel McGarraty of the 79th Regiment, died in strange circumstances. While travelling, one brother become ill, and was left in the care of the other. When their comrades returned with help, both brothers were dead. It was said that while fever killed one, the terror of being alone in the woods claimed the other. Perhaps no phrase better summarizes the life and career of Lieutenant Henry Bayfield, meticulous hydrographer for the Royal Navy. Hydrography (the measurement and description of waters) was a relatively new concept when Henry Bayfield assumed command of the Great Lakes Survey in 1817. In the summer of 1820, he and his crew covered harbours on Lake Erie and the east coast of Lake Huron, surveying 6000 islands. A house with office was constructed at Penetanguishene for Bayfield, and he spent the winter plotting data for future chart work. The ice on Georgian Bay was still 10 inches thick in the middle of May 1821, but by the end of that month Bayfield and his crew were back to work, accurately charting up to 100 islands per day. Bayfield's writing from summers on Lake Huron gives us a hint of how tough his task was. He and his crew were frequently out until November and December, taking shelter at night under their small boats with sails as cover. Only the smoke from their campfire protected them from mosquitoes, and their provisions often went bad. Outbreaks of scurvy were noted in 1820 and 1821, and during one expedition, Bayfield and his men caught crows and gulls for food. After completing the Lake Huron survey in 1823, Bayfield went on to survey Lake Superior, the St. Lawrence River, and portions of the Maritimes and Labrador. He retired as Admiral in 1867 and spent his final years comfortably in Charlottetown, Prince Edward Island, dying at the age of 90 in 1885. His life's work still forms the basis for many of today's navigational charts. James Keating served as Fort Adjutant of the Military Establishment at Penetanguishene for 20 years. As Adjutant, Keating was responsible for coordinating all aspects of the overall operation of the garrison. He provided continuity to the entire military apparatus at Penetanguishene. While other senior officers came and went as their detachments rotated through the Canadas, Keating was always on hand to maintain the required flow of organization and authority. Built in the 1830s, the impressive Officers' Quarters is the only original building standing at Discovery Harbour. As in all parts of Upper Canada, military officers at Penetanguishene were privileged. The Officers' Quarters provided a high level of accommodation for those in charge of the garrison units. Since much of the day-to-day supervision was delegated to subordinates, higher-ranking officers would often pursue cultural and recreational activities such as recitals and theatre, and spent time entertaining local dignitaries and attending sporting events. Discovery Harbour is part of Huronia Historical Parks, which includes Sainte-Marie among the Hurons.